This document is © 2005 - Jared "Smitty" Smith. You are free to translate this article as long as a link is provided to this document. If you contact me, I will provide a link to your translation. A PDF version is available by clicking the icon below. 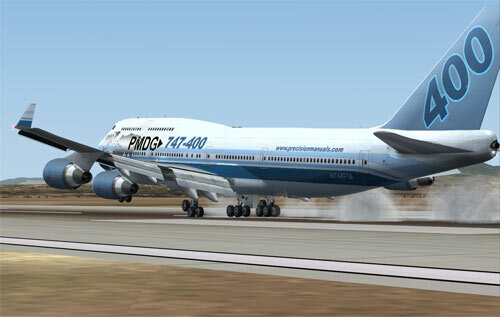 guide you through the standard startup, taxi, takeoff, climb, cruise, approach, and landing procedures for the PMDG 747. You will notice that this guide deviates from the published Normal Procedures checklist. This is done to facilitate learning the 747 systems, to save time, and to only focus on the systems that are likely to be necessary to establish an operational aircraft. I believe all of the procedures and information here to be factual, though it is often overly simplified and not necessarily in the correct order. If there is something that is incorrect or unclear, please let me know. IF YOU HAVE QUESTIONS REGARDING THE OPERATION OF THE AIRCRAFT, REFER TO THE MANUAL OR POST THEM TO THE PMDG SUPPORT FORUM. I WILL NOT ANSWER STUPID QUESTIONS THAT ARE ANSWERED ELSEWHERE. :-) On the other hand, if you have a legitimate question or concern, please contact me and I'll be happy to respond. 1/3 or less fuel in the fuel tanks. 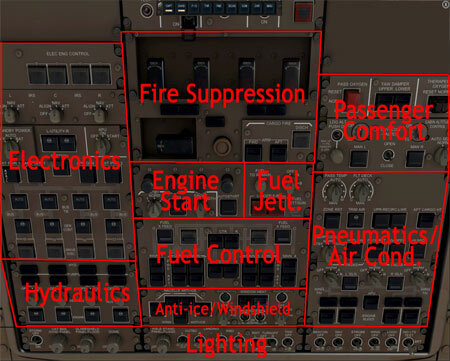 This can be set in the PMDG... General... Options... Fuel settings. I STRONGLY recommend downloading this cold/dark scenario and flight plan as all graphics and panel states will match those found in this guide. 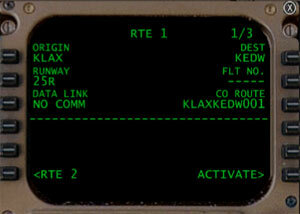 The flight plan followed in the tutorial (KLAX-KEDW) is also provided. After downloading, extract the ColdDarkKLAX.FLT file to your Flight Simulator 9\Flights\PMDG folder. Extract the ColdDarkKLAX.sav file to the Flight Simulator 9\PMDG\747400\PanelState folder. Extract KLAXKEDW.rte to your Flight Simulator 9\PMDG\FLIGHTPLANS folder. 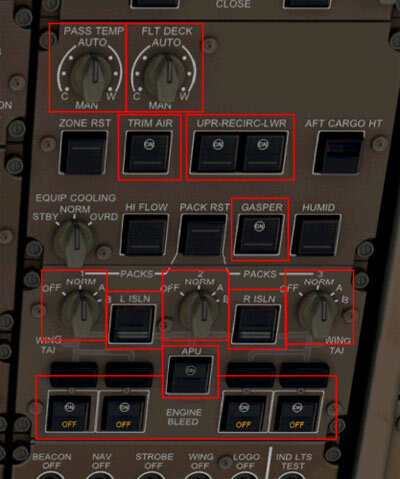 When you are done, open FS9 and click Select a Flight (or Flight... Select a Flight if you're already in the cockpit). Select PMDG under Choose a Category and then select ColdDarkKLAX under Choose a flight. 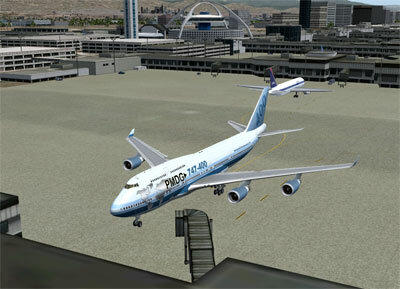 Click OK to enter the dark cabin of your 747 which is parked at gate I1 at KLAX. You'll notice that the cockpit is totally powered down. Usually while parked at the gate, there would be some power already flowing and if the pilot that flew the plane before you is nice, he'd have left a light on for you. But your plane's been parked for awhile and is totally powered down. Left click to press the button to turn on the battery. The battery button has a protective cover over it that closes when the battery is turned on. If it is closed, you can right click to open it, then left click on the button to turn the battery off. Let's leave the cover closed so we don't accidentally turn it off. 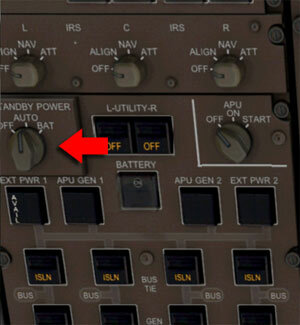 The battery should remain on at all times as it provides a backup power source to critical flight instruments. The standby power switch tells the electronics system of the aircraft where it should draw it's electrical power from. When set to OFF, only a few systems will be powered by the battery. AUTO allows the electrical system to draw the power from the best available power source. BAT will only draw power from onboard batteries, giving you about 30 minutes of power. We'll leave this switch on AUTO and the electrical system will handle the distribution of power automatically. The ELEC ENG CONTROL switches allow the electrical system to operate the engines. These buttons also have guard covers, so right click if you need to open them and be sure to close the guard when you're done. The 747's engines are primarily controlled by electronic systems rather than hydraulic or pneumatic systems. If the electrical engine control system for an engine fails, you can click the button again to switch to an ALTN (alternate) electrical system. 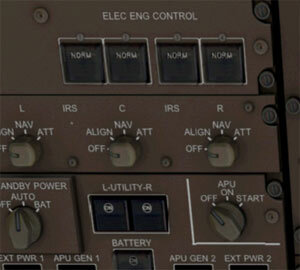 Turning the GENerator CONTrol buttons ON will allow the engines generators to provide electrical power to the system. 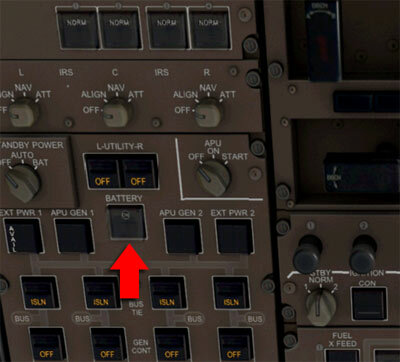 Don't worry if OFF is illuminated on the GEN CONT buttons - this just indicates that the system is currently off (engines are off), but that the generator control system will be ON as soon as the engines are started. External power is available from a cable connected to your airplane from the airport electrical system. AVAIL will be displayed if external power is available. Ground power is only available if your parking brake is set (CTRL + .) and you are stopped at an airport. External Power 2 may not be available at all airports. If it is available, turn it on. If not, don't worry about it - one source of external power will suffice. The external light controls are found in the lower right of the OVHD panel. We will not turn on the BEACON lights until we're ready to be pushed back or begin taxiing. The STROBE lights aren't turned on until we're ready to takeoff. We will now begin aligning the Inertial Reference System. The Inertial Reference System is comprised of three gyros. These gyros detect very faint movements of the aircraft in all directions. 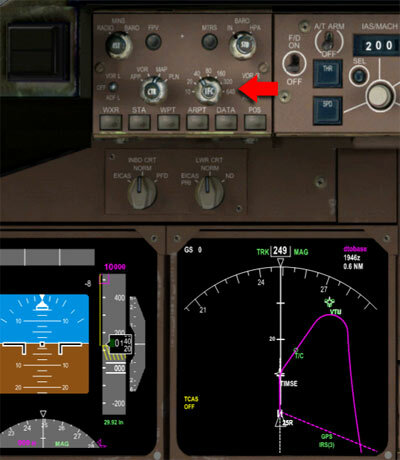 They send information to the flight computer indicating if the aircraft is moving, which direction it is moving, and how fast. The IRS is the primary mechanism for providing accurate positioning and automated flight control for your aircraft. In order to function properly, the Inertial Reference System must be powered up and given an initial 'home' position from which all movement will be referenced. The IRS can only be powered and aligned while your aircraft is stationary on the ground. Actual alignment time is 10 minutes, though this can be customized in the options (PMDG... General... Options... IRS). As it'll take us a while to finish powering up the aircraft, the 10 minute time period will be fine, but you may want to shorten this time period because you'll be an expert at firing up this bird after a few tries and may not want to wait around for the IRS to finish aligning. Remember, you cannot properly align the IRS system if you are moving. Open the FMC by clicking the FMC button on the panel switcher. 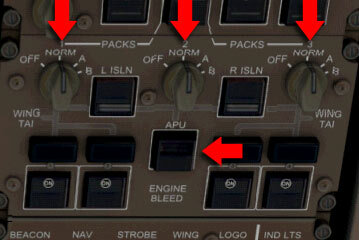 Click the FMC button located at LSK (Line Select Key) 1L (this means the first button down on the left). Click IDENT at LSK 1L. Ensure that the FMC is reporting accurate information about your current aircraft. Click POS INIT at LSK 6R. 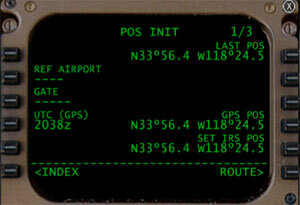 The POS INIT page of the FMC allows you to determine and input your aircraft's current position. Turn on all fuel XFEED (crossfeed) switches. Fuel crossfeeds distribute fuel between fuel tanks. Enabling the XFEED now	ensures that if fuel is loaded into the aircraft on the ground that it can flow freely throughout the system. As your plane may be fairly full of fuel on departure, this also ensures that the XFEED switches remain on once the engines are started. The switches display horizontal lines when the XFEED is ON. The engine 2 and engine 3 XFEED switches have guards - right click if you need to open them. Nacelle anti-ice distributes air from the engines back onto the engine casing to slow formation of ice. Wing anti-ice distributes engine bleed air to the front of the wings. Both should only be enabled when the temperature is less than 10° C and visible moisture is present - something that isn't likely for the Los Angeles area. Nacelle anti-ice should only be enabled after the engines are started. Wing anti-ice should only be enabled after takeoff. 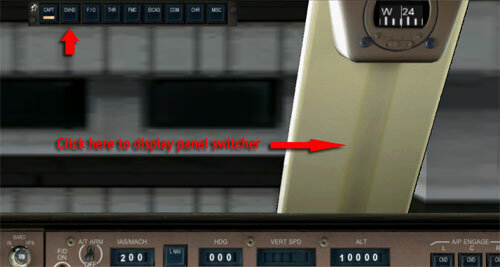 Rotate the APU switch to START (right click twice). The switch will automatically set back to ON once the START command has been given. It'll take several seconds for the APU to start. The Auxiliary Power Unit is a fuel powered engine located in the tail section of the aircraft. It provides hydraulic and pneumatic pressure and electrical power to the aircraft. In short, it provides most everything the aircraft needs to function except for the main engines. Seeing as the passengers are beginning to board now, it's a good idea to now start the APU so the air conditioning and recirculation system can begin to work. We'll now set up the air conditioning and comfort systems. 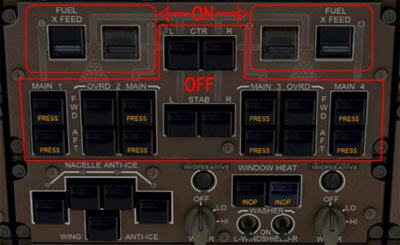 These controls are found at the right side of the OVHD panel. First ensure that PASS TEMP and FLT DECK temperature controls are set to AUTO. If you or the pax get too hot or cold, you can adjust the temperature Colder or Warmer. If you're carrying sensitive cargo (vegetables, animals, etc.) 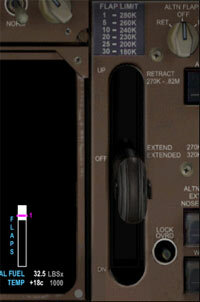 in the aft cargo hold, be sure to enable AFT CARGO HT before takeoff or it will get VERY cold back there. You should not enable it until the cargo hold doors have been closed. Turn ON the GASPER. The gasper provides pressurized air to the passenger seat comfort units in the overhead consoles - you know, the adjustable control knob you can never adjust to blow just the right amount of air in the right direction. 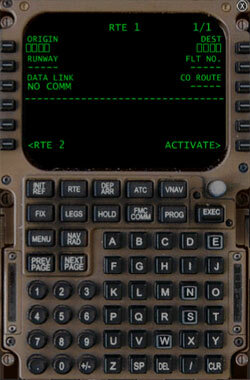 Let's now continue to program the rest of our flight information into the FMC. Enter KLAXKEDW into the scratchpad by pressing the letter keys. Alternatively, you can enter text into the FMC by pressing the black KBD bar to the right of the letter keys. KBD will be displayed. You can now use your keyboard to type information into the scratchpad. Be sure to press the black KBD bar again when you're done. Enter 10 into the scratchpad and press LSK 4L. This sets the required RESERVES for this flight to 10 percent. If your fuel goes below this, you'll receive a low fuel warning. Write down or remember the trim number as we'll need it also in a moment. Ensure that NO SMOKING and SEATBELTS selectors are set to AUTO. 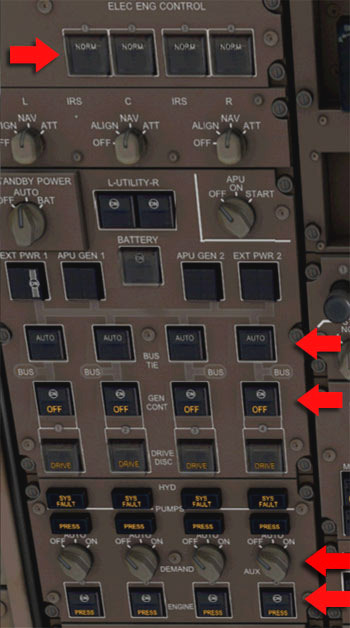 AUTO will turn off the SEATBELT indicator when you are above 10,000 feet. If you'd rather control this manually, you can set it to ON and then turn it OFF when appropriate. 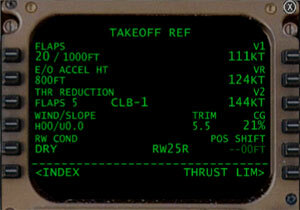 We're now fully configured to begin our pushback and engine start. The passengers are on board and you've just been given your clearance. As things start to happen very quickly from here on out, don't be afraid to pause your sim between steps. 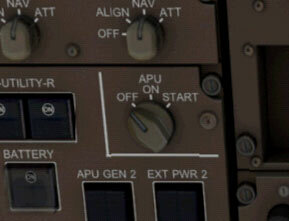 As soon DIST and DEG are entered, left click on the RST button to alert the ground crew that you're ready for pushback. Follow the radio instructions from the ground crew and be sure to release and set the parking brake (CTRL + . 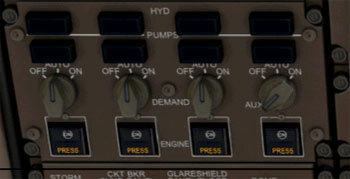 or switch on the throttle console) when instructed. Turn OFF autostart. We will be starting the engines manually because it's just cooler that way. Ensure all throttles are at idle (F1 key) because the FAA and our passengers don't want us to spin circles when we start our outboard engine. Quickly open the throttle panel. 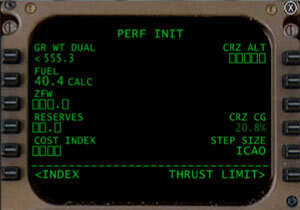 Watch the N2% RPM increase in the EICAS display. Bleed air from the APU is being 'blown' across the engine and is beginning to turn the turbines. When the N2% RPM indicator on the EICAS reaches the magenta line (around 14%), switch the Fuel Control Switch for Engine 4 to RUN. The engine should start up and then idle back. Don't you just love that sound! Release parking brake and taxi to runway 25R (ahead and to your left). As you taxi, review your V1, Vr, and V2 speeds. Ensure all other flight systems are set and you're ready to fly. When the runway is clear of incoming traffic, taxi onto the runway and stop (called "position and hold"). Ensure that F/D is ON, runway heading (249) is set in HDG, IAS is set to V2, LNAV and VNAV are armed, and that altitude is 10,000. If all is set, then you're ready to fly! 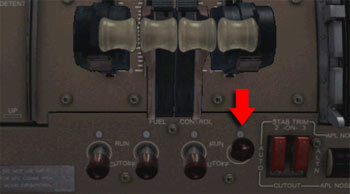 The TO/GA (Take Off/Go Around) button tells the flight computer to control throttle settings during takeoff and initial climbout. 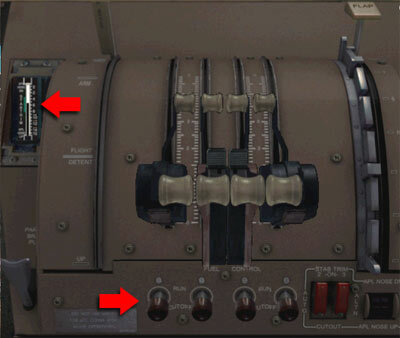 The TO/GA button is located on the screw at the upper right of the AFDS MCP (in the real cockpit, it's a thumb activated button on the yoke). 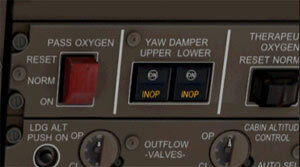 When the copilot announces V1, this means that you're going to fly, or at least try to, if you experience any problems. You are now going too fast to safely reject the takeoff. Any problems that you encounter should be taken into flight with you. Adjust pitch and roll with the controls to center the flight director indicators - the pink lines on the Primary Flight Display (PFD). You should try to keep the pink lines centered in the PFD. This will direct your airplane to climb at the maximum safe climb rate while ensuring that you remain on the heading you've entered into the MCP. As soon as you're clear of the runway and your climb rate is at least 500 feet per minute, set the landing gear to UP. 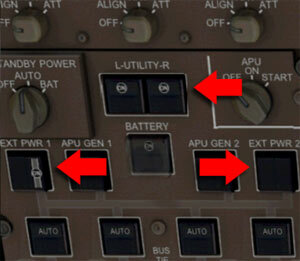 As soon as you're over 500 feet altitude, select one of the A/P ENGAGE buttons on the autopilot MCP. You'll notice that as the flight continues that the autopilot will control altitude, speed, and direction. 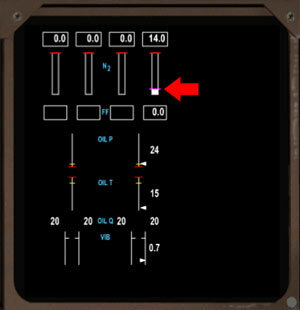 As soon as you're established at 15,000 feet, open the COM panel. At about 10 miles from the VCV VOR, set MCP ALT to 0. Be sure to do this well before you cross the T/D (Top of Descent) indicator on the ND. Do not press the center of the ALT button or the autopilot will descend to that altitude now. Simply dial the number into the ALT indicator. This will allow the autopilot to begin it's descent at the scheduled time. 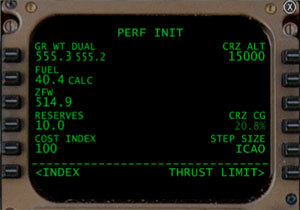 The autopilot will not descend below the altitude set in the MCP. Watch as the plane begins the programmed descent near the VCV VOR. 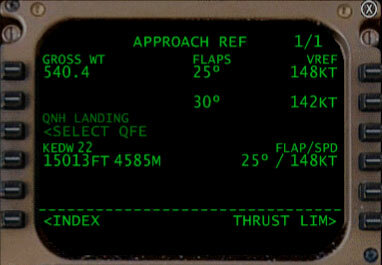 Ensure that flaps are at 25, the gear is down, and that the plane is properly following the ILS. Sit back and enjoy the autolanding. 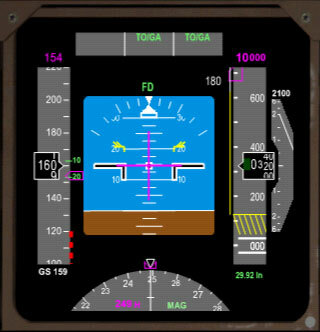 The autopilot will fully control all aspects of the aircraft until touchdown. 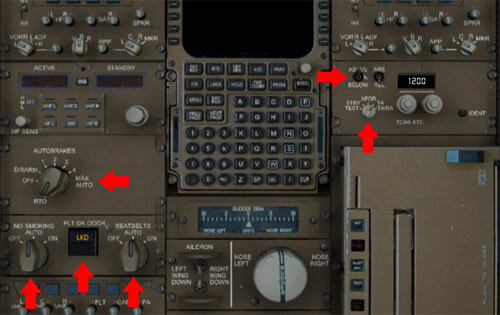 If you'd rather land manually, you can disengage the autopilot by pulling down on the DISENGAGE bar (or Z key), turning A/T ARM off, and setting F/D to OFF. You will then have full control over throttle, pitch, and roll. 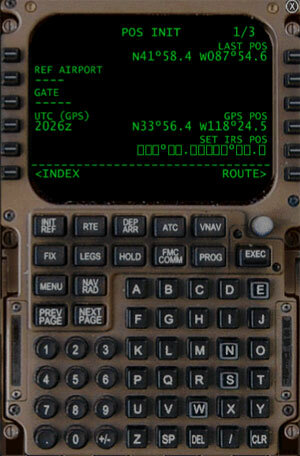 Manually keep your speed at approach speed + 5 knots and follow the ILS indicators to the runway. As the main wheels touch the ground, bring the throttles to idle and then engage full thrust reversers (hold down F2 key). The autopilot will perform a rollout maneuver that will keep the aircraft centered on the runway. 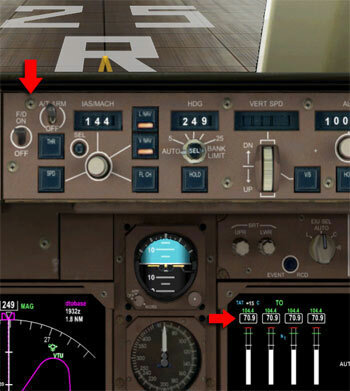 Braking is also performed automatically, though engaging thrust reversers will decrease brake heating and wear. Do not touch the controls except to engage thrust reversers - the plane will do everything else. As soon as, or shortly before, the aircraft comes to a complete stop, DISENGAGE autopilot, set A/T ARM to OFF, and turn the F/D OFF. The aircraft is now in your control and you may begin your taxi. When you apply taxi thrust, the speedbrakes will retract. Exit the runway when able and taxi toward the gate or parking area of your choice. The airport here is HUGE, so you've got plenty of time to work through the remainder of the checklists. Set the parking brake as soon as you're fully stopped at the gate or parking area of your choice. Ground power should now be available. However, ground power is not available at all airports. 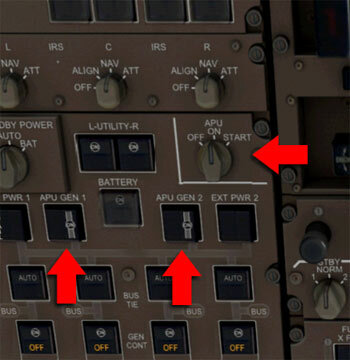 You would typically switch to ground power and turn off the APU at this time, but if ground power is not available, leave the APU on to power the aircraft until you're done with the shutdown checklist.